I was back home yesterday night post work only around 11 PM IST and it was not until today morning that I came to know of our former President Shri A.P.J. Abdul Kalam’s demise. As I browse through my Facebook stream filled with messages of individuals who had their fair moment of inspiration meeting, working with and learning from the Hon’ble President, I would have loved to say that I had the honor of knowing him personally, discussed his vision for India 2020 and what made him believe in it so much, along other matters that inspired him to act on his beliefs and which led to such a remarkable inspiring life. But, all I have to offer are 15 seconds of interaction with him plus a few minutes spent observing him from close. The year was 2012. More precisely, it was around 6 PM, Dec 10, 2012. I had moved on from my role at the Indian Private Equity and Venture Capital Association (IVCA) and taken my leap into entrepreneurship working on a high-tech venture with a global innovator. Most of my days were spent working from my home in New Delhi, India on Calls + Skype with the core team in Mumbai, India; with the exception of meetings taken up now and then. Morning of December 10, I was informed by my parents that Dr Kalam was expected to be in the Housing Society that evening to bless a newly married couple and that I be ready by the time they were back from work. (I was residing in a Housing Society packed with IIT – Delhi Professors who have worked on and continue to work on some really incredible things, and the groom was the son of one of the Professors who had worked with Dr Kalam closely). Of course, during the course of the day, I forgot all about it. When evening, and my parents, arrived, they did not seem too happy to see me still huddled over a laptop in a t-shirt and trackpants; especially when I added that I had a call scheduled with the founder and might end up missing the opportunity to see Dr Kalam up close (I was an idiot). With news of Dr Kalam’s convoy being already in the building, I jumped onto the Concall and we got sharing details from the day. During the course of the discussion, it struck me we could present what we were working on to Dr Kalam for his feedback and guidance, and asked the founder if it made sense. He shared we should. With no time to waste, I cut the Concall realizing we only had 5-10-15 minutes approx worst case scenario for Dr Kalam to leave the premises ; and given I was not already connected with him, there was no time to shave, change into formals or even wear shoes with my sporty outfit (I am positive I would have chosen sandals since choosing shoes meant I would have to pick up socks and put on my sports shoes). Washing my face and rushing downstairs, I was pleasantly surprised to see that only a small section of the building had been cordoned off and no issues with traffic could be seen outside the gates of the Housing Society, as is common with most VVIP movement. Though a ‘bit off’ the dress code, waiting patiently along with other residents for Dr Kalam along the narrow red carpet path that had been created for him along the cordoned area, we finally managed to catch a glimpse of the legend. Dr Kalam looked at ease and was smiling at all the individuals who had assembled to see him. He shook hands and smiled as he made his way towards his car at the end of the red carpet. Realizing that this would be the only opportunity to connect with Dr Kalam, and sensing the importance of his time and schedule, I decided I had to make it quick and stepped out of the assembled line to share that our team was working on few technological innovations that could hold promise for the nation, and whether he could share an email id where we could share more details and connect with him. Dr Kalam listened intently for a brief second, nodded and then gave me his mail id… right on the spot! Not wishing to waste any more of his time, I thanked him and stepped back. He started towards his car, but then turned back to shake hands, this with a smile and firm eye contact (till this day, I am not sure whether this was a test). Later that night, as I reflected on the experience, I realized that I had forgot to introduce myself to him in those brief seconds. Given I had done nothing incredible compared to what he had done and continued to do till the moment he took his last breath, it didn’t really matter. 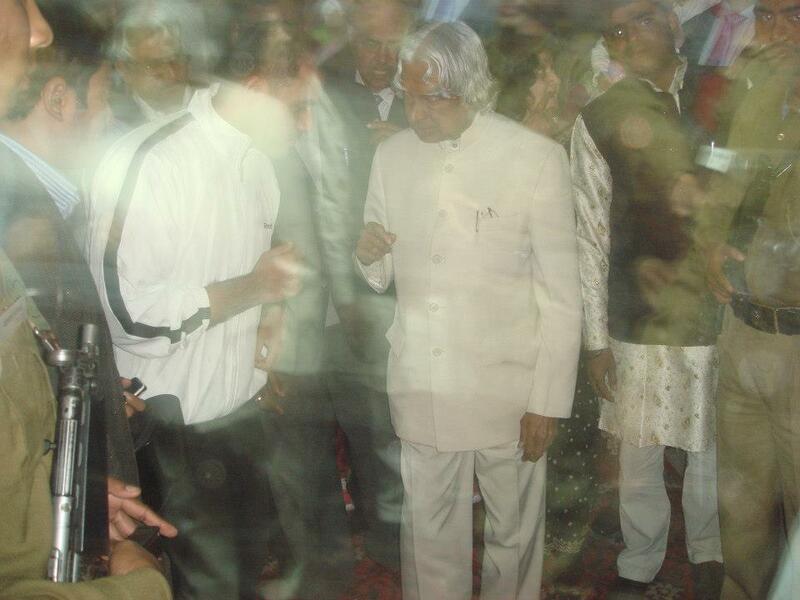 When Dr Kalam decided to respond to my request for his mail id, there was no ‘Connect with my Assistant / speak with this guy or that guy please’, but just pure affirmative action without knowing who I was or what I did – I was just another guy waiting and standing in line to greet him as he made his way out from a building to his car. He did not judge me from my appearance as to who I might have been or what I did for a living. He truly was a learned man, not just amongst the most humble and down-to-earth individuals I have met till date, but he also operated from a place deep down inside his being. All in all, his moments spread across time ended up in what was an awe-inspiring, remarkable and inspirational life. Hope I have the honor of meeting you again sometime in the next life/ after life. Rest in peace, Dr Kalam. You did well. p.s. : I did not hear back from Dr Kalam on the initiative despite 1/ 2 follow backs. I knew there was the possibility of checking with the Professor to facilitate a personal audience, but knowing that Dr. Kalam had moved on from active work and was focussing on his mission to empower the youth of the nation to act on their potential, I knew he had more important things to do and did not wish to waste any more of his precious time.